We are all familiar with the present-day shape and extent of our province and, perhaps, many of us are in the habit of comparing the size of new lands we study with that of our home territory. When we make such a comparison we often feel an unexplainable sense of pride that we live within boundaries which enclose so many thousands of square miles, and that, in area, our province is much larger than a great number of nations of the world. Manitobans of the past, if they too liked to compare the extent of their land with others, would not have found as many occasions when their province was so favoured, and, in addition, they may have felt a sense of resentment, however mild, that their province was referred to often as the "postage stamp" province. When Manitoba was established as a province in 1870 it was in size about one eighteenth of what it is today and its shape and size, when viewed on a map of Canada, was such that "postage stamp" served to describe it quite well. The boundaries enclosed the territory, the center of which had been developed by the peoples of the Red River Settlement. In the next few years thousands of settlers came to Manitoba and the North West Territories to take up the free homesteads offered them by the Canadian Government. The growth of the West led to a decision to enlarge the Province of Manitoba and in 1881 the boundaries were extended to include about five times as much land as in the original province. Manitoba then had grown to the west, to the north, and to the east. How far to the east, however, no one was quite certain. It was to take 74 years and 43 Dominion-Provincial Acts and Orders-in-Council to settle finally the question of the Manitoba-Ontario boundary. While this settlement was largely brought about in a friendly manner there were some lively disputes over the problem as to whether Rat Portage, now Kenora, was situated in Manitoba or in Ontario. Each of the provinces proclaimed its laws in force in the district and each built a court house and a jail and appointed magistrates and constables. Rat Portage, because of the hundreds of men in the district constructing the main line of the Canadian Pacific Railway, was a wild and wide-open town. Prisoners committed to jail by one province were released by the other; constables who made arrests were themselves arrested by constables of the other province; the Manitoba jail was stormed and burned and Manitoba's Premier Norquay, along with a force of police, travelled by special train to arrest those responsible and to bring them back to jail in Winnipeg; and when each province held an election on the same day Manitoba sent a militia force to Rat Portage to protect its polls. Before the disputed district was given by order of the Canadian Government to Ontario in 1884, Rat Portage had the most, but undoubtedly the worst, government ever known in Canada. In 1912, Canadian legislation extended Manitoba's northern boundary to its present limit at 60 degrees north latitude and extended the eastern boundary to the north-east to Hudson Bay. This latter section was described in words as reaching the Bay where the 89th meridian intersects the southern shore. When the final survey of this boundary was completed in 1950 it finished just 16 feet from the theoretical terminal as defined in the act of 1912. 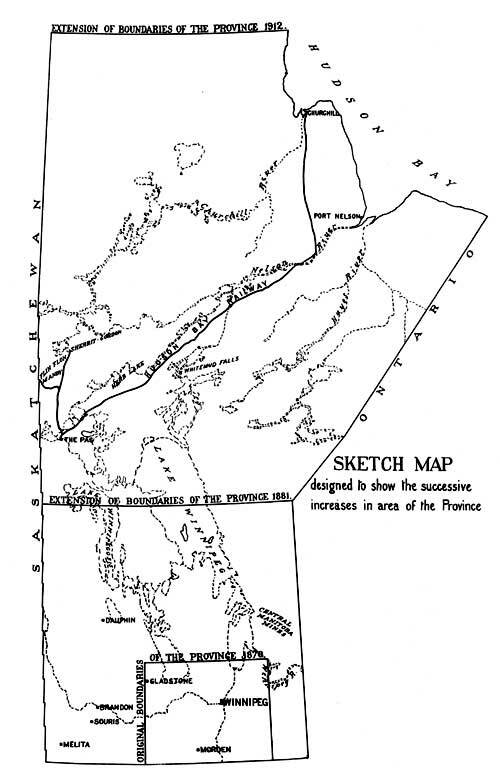 In 1955, the governments of Manitoba and Ontario received and accepted a boundary commission's report embodying the last word of the surveyors on their boundary. Today, Manitoba stands as the "Keystone" province in Canada's great continental arch.